2013 is almost over. Black Friday has come and gone. Christmas music has taken control of 90% of the public radio waves. GOTY awards and starting to be handed out. and we all remember the year fondly while looking ahead to 2014. But what about those games that didn't receive praise this year? Someone must love them right? On Black Friday I only planned to get one thing and that was the discounted year of PSN+. In the weekend and Cyber Week after that I picked up Killer is Dead for $20. 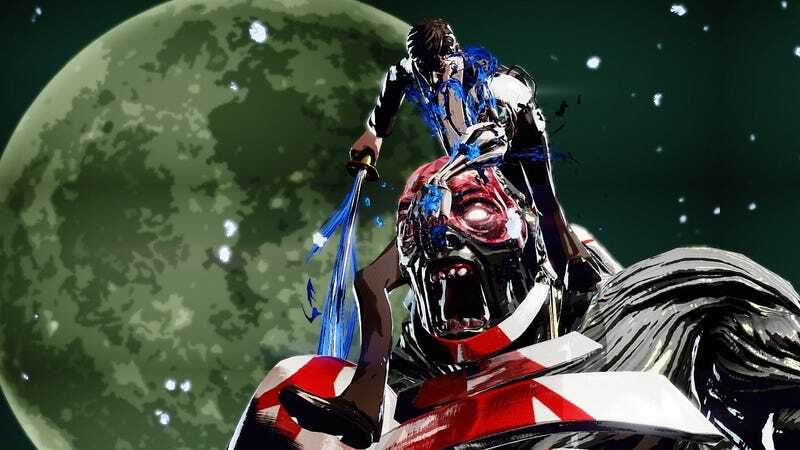 For those of you who don't know Killer is Dead is the latest game from Suda51 that came out to rather mediocre acclaim. The game was criticized for being weaker than his previous games and being extremely sexist. Knowing all this I took the plunge and bought it. I played it over this weekend and wouldn't you know it. I had a blast. The Good: The wackiness of the game as a whole. I guess Suda51 is well known for it but Killer is Dead doesn't try to take itself seriously at all. There are regular 4th wall breaks. cutscenes that makes little sense, and just general shenanigans. Mondo's missions take him from an Alice in Wonderland maze, to Area 151, the top of a possessed Thomas the Tank Engine, the moon itself, and beyond. When a government agent briefs Mondo and the gang on the giant alien terrorizing New Mexico they act as if they're watching a cheap B-movie. I'm not gonna go into the artstyle which I'm not even sure how to describe honestly. I'll just say that its pretty and enjoyed looking at it throughout. The Mixed: Combat. I'm gonna be honest here. I've never played any other Suda51 games before. I don't know how their combat systems compare to Killer is Dead. I just know that most seem to say that Killer is Dead is weaker than previous Suda games in the regard. Now that that's out of the way, let me try to explain it. KID has a rather simple 3 button combat system. Square/X for sword attacks, Triangle/Y for guard breaking punches, and O/A for guards and dodges. The meat of the combat in the KID is attacking the enemies while dodging their attacks. Perfect dodges will allow you to perform a counter attack where you get a bunch of free slashes in. Enemies will occasionally carry shields or guard themselves which is where your punches come in. As you attack your combo count will rise and so will your "Blood Meter" the blood meter starts off at level 1 and through unlocks it can go up to 5, at each stage Mondo's attacks become faster and stronger. Mondo also has a robotic arm which can transform into tools such as a gun or a drill which is powered by a separate blood reservoir that fills up as you damage enemies. The combat system itself is simple enough but it does take a bit of work to get used to. Where I felt it was the most fun though was in normal enemy encounter where I would be attacking an enemy and then dodge out of the way of another and counterattack it. Watching the blood meter fill up and Mondo's attacks become fancier is an awesome feeling and its so satisfying to watch the combo counter go up and up and up. Where the combat lets me down though is the Boss fights. Attacking and dodging multiple enemies is fun but when it is just one the fun dies off and it becomes a chore as I just continue to evade the same attack patters and counter attack. The final boss of the game was awesome from the climactic view but the actual fight was lame as I disposed of him without much effort. The Bad: Gigolo Missions. This is where the largest criticism of the game comes from and not without good reason. These things are just... dumb. Gigolo Mode involves Mondo visiting one of four different women and then just staring at her I guess. In these minigames Mondo sits silently while trying to sneak glances at the girl's more lewd areas. Once he has had enough you can give the girl a present and then repeat at nauseum until she and Mondo finally leave for "private time." This is the only way to unlock Mondo's other arm modes such as the drill and freeze ray. Gigolo Missions are called misogynist and not without good reason. I'm not one to get bothered by that sort of stuff but I was offended by just how dumb it was. I doubt there's anyway you can make the missions less sexist but at least make them fun. They could have made it a minigame with dialogue choices and let me live out my suave James Bond fantasys and trade double entendres all night. Not this dumb peeping game. Killer is Dead won't be winning any awards. I'm not sure very many people have even heard of. Despite its mediocre and weak reviews though Killer is Dead is one of my favorite suprises of this year. Despite its flaws Killer is Dead kept me entertained throughout and I more than got my money's worth out of it. I can understand the hate the game but it's one of my favorites of 2013. So TAY I wanna know if there were any games in 2013 that you really enjoyed despite being panned or viewed as mediocre by critics. What hidden gems are out there in 2013? CreaTAYve Rambling is a semi-regular (as in whenever I feel like it) article I put together where I just ramble on about what I feel like. I make no guarantees of coherence, grammatical correctness. Does anyone know how to make soft-boiled eggs?